There comes a plenty of food exhibitions from time to time but SIAL 2016, the world’s largest food innovation exhibition, is one such platform that inspires food businesses around the globe. Commencing from 16th October 2016, SIAL will last till 20th of the same month and will have more than 6,500 French and international exhibitors from 105 countries display their foodstuffs. The exhibition will also have around 7,000 companies from more than 100 countries presenting their products to retail and foodservice professionals. With 21 exhibition sectors, SIAL will once again be casting the spotlight on a host of innovative food products. A visitor is sure to find information on food offerings such as beverages, charcuterie, cured and salted meats, tinned and preserved foods, gourmet foods, savoury grocery products, sweet grocery products, fruit and vegetables, semi-processed food products, meat, poultry, etc. Innovation holds a paramount importance in the food sector and SIAL has a true impact on the food service professions. The innovative techniques at SIAL enable the attendees to identify and decipher the food service trends. Also, SIAL allows them to discover fresh produce and raw supplies: an ideal, good quality basis for their work. 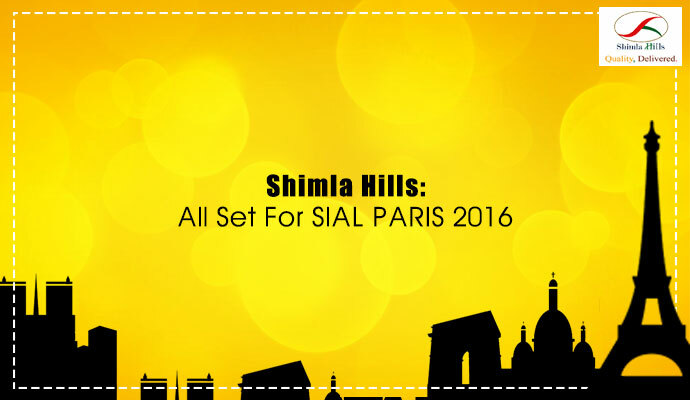 Shimla Hills takes pride in announcing that it is participating in SIAL Paris and will be showcasing its wide range of products. One of the leading and trusted name in the agro-products industry, Shimla Hills manufactures a wide variety of products that goes in the making of jams, ice-cream, jellies, dessert, puddings, bakery fillings, baby foods, flavours, etc. The raw material of Shimla Hills are handpicked and are checked on various parameters before their processing. Be it pulp, puree, juice concentrate, spices, nuts or IQF products, Shimla Hills utilizes premium packaging options to keep the quality and flavor of its offering intact during shipment. Hope to meet you there at SIAL Paris 2016.